French stayer Verema, owned by prominent breeder Aga Khan, has been confirmed as a visitor to Australia for the 2013 Melbourne Cup (3200m). Verema won the Group 2 Prix Kergorlay (3000m) at Deauville in France last Saturday and trainer Alain de Royer Dupre was able to convince Aga Khan after the victory that the Barathea mare was a perfect candidate for ‘the race that stops a nation’. Alain de Royer Dupre will be making his fourth visit in a row to Australia for the Melbourne Cup, after winning the race with Americain in 2010, but Verema will be the first ever runner in the prestigious race for Aga Khan – who has won some of the biggest races in the world including the Prix de l’Arc de Triomphe,Hong Kong Vase and Irish St. Leger. Georges Rimaud, the French Racing Manager for The Aga Kha Studs, confirmed the news overnight and indicated that he was confident Verema would be very competitive in the Melbourne Cup. “His Highness the Aga Khan is delighted to have his first ever runner in the Melbourne Cup,” Riamud told Racing Victoria. 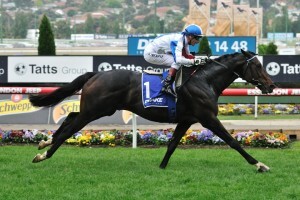 “Verema is an improving filly that has won two consecutive Group 2 staying races against the colts. The four-year-old is yet to taste success at the highest level of racing, with her best finish at Group 1 level a fourth place finish in the Prix Royal-Oak (3100m), but she has recorded two strong victories in the Group 2 Prix Maurice De Nieuil (2800m) and the Prix Kergorlay this campaign. French form lines have dominated the Melbourne Cup in recent years, with Americain (2010) and Dunaden (2011) winning the Cup before starting as two of the favourites for the 2012 edition of the race, and Racing Victoria’s International Recruitment Officer Leigh Jordon believes that Verema is a definite chance to give the French their third victory on the first Tuesday of November. “We have seen French horses win two of the past three Cups and Verema will arrive in Melbourne with a similarly impressive formline,” Jordon said.